Posted Middle East Eye July 24, 2018. 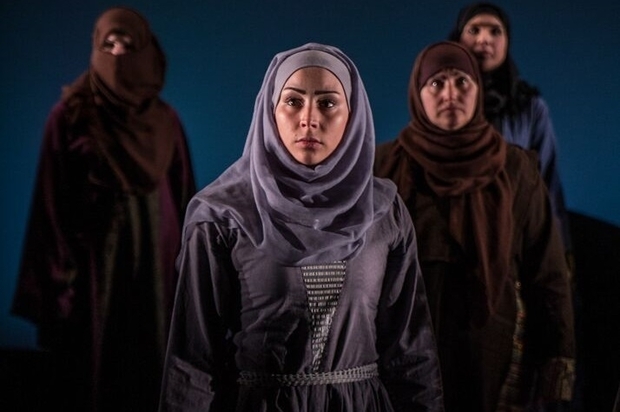 Performed by 14 Syrian women who have fled their homeland, Queens of Syria is a theatrical adaptation of Euripides anti-war play, The Trojan Women, written in approximately 410BC and the first known dramatisation of a war and its female victims. Presented by Developing Artists and The Young Vic, this production soon completes its tour of the UK before performing for three weeks at the National Centre for Culture and Arts in Amman, Jordan. The production is interwoven with Yasmin Fedda’s award-winning documentary about a similar process in 2013, and seamlessly jumps from documentation of the emotional process, true-life accounts and the words of Hecuba, Adromache and the Chorus of the Trojan Women. The number of Syrians displaced outside the country is estimated by the UNHCR to be well over four million. Of these, over 75 percent are women and children. With all the news coverage, statistics, and the overwhelming scale of the crisis, aid workers have talked about the West’s “compassion fatigue”. But this production talks from the heart, and in such a way that the audience is forced to not merely bare witness but to emotionally engage and wrestle with difficult, seemingly impossible feelings. The original project, which took place in Amman in late 2013, was created by a team of British and Syrian theatre producers and journalists, and involved six weeks of drama therapy workshops geared towards a performance. The process of drama therapy involved documenting and articulating the real stories and experiences of these women for the purpose of not only coming to terms with the trauma but giving a clear voice outside of the confines of the refugee camp, and not generalised or muted by the press. These are not the voices of commentators, politicians, journalists but mothers, daughters, sisters, aunts and grandmothers, whose details of their experience and escape one could never imagine. Most importantly these 14 strong women challenge the assumptions about Muslim women and about refugees. It would not be fair to describe this purely as a theatrical production – it is the celebration of a process of wounds (some healing, some not), grief, and finding a way to deal with these traumas as a community of women. We share the process of them growing into performers, overcoming shyness, sometime facing disapproval to stand strong on stage and deliver. The show itself begins with the chorus from the Trojan Women spoken directly the audience by all the performers in unison. Both the staging and the lights are stark and strong, allowing us to focus on the words and the performers without distraction. The soundscape provides a continuous ominous reverb, the kind that makes the brickwork of a building shake. All the play is directed straight to the audience except for some moments of intimacy between friends or the occasional song. However as we are reminded (unnecessarily I believe) the actors are not here to entertain us or to sing us a song. This was already clear, at one point an audience member behind me tried to unwrap a sweet and was met by a flash of angry heads. This was not a time to switch off, catch up or collect information. The production held us emotionally hostage and baptised us in the sadness and truth of its stories. It is a shame there weren’t more moments like this as humour has the power to make us know and love our performers more, but more importantly, it opens our heart to accept the knife of tragedy even more. Zoe Lafferty has done a stunning job here of staging this act of storytelling. Also her work with the actors is clear. Standing strong and tall, not moving except to speak, hands rested on laps, a theatrical neutrality that, like the staging, allows us to hear the women speak in their naked truth. The skill the performers displayed with their voice, presence and movement was not only impressive, it gave strength, dignity and power to their words and our memory of them standing both together and alone. Each account by each actor was spoken as a letter, occasionally with the assistance of a microphone. A woman in the advanced stage of labour at a checkpoint arrives at an empty hospital. Days later she flees her building when a car bomb goes off outside, but has to return get her older daughter who she forgot, finding her injured under shards of glass. The aunt who refused to believe that the mutilated body before her was indeed her son and denies it out loud for the whole funeral procession, making all the men weep. A woman forced to leave her homeland and taking the tea flask because it was so precious to her. Despite the harrowing accounts of war, out of it all came the revelation of how profound the love of one’s country is and how it wrenches the heart to leave it. There may be relief in escaping with all the family safe but to turn around and perhaps see one’s country for the last time has its own grief. Syria “is our husband, our son” says one. Another woman describes her homeland as a videogame that everyone wants to join in but no one wants to open their arms to accept its victims, the sea being the only place to accept them unconditionally. During one of the short excerpts of the documentary interspersed with the live theatre, one woman expresses the obvious question: “What’s the point? What’s theatre ever going to do?” She replies her own question that in the West we respect theatre, so maybe this is a platform where we will listen. It is true. We did listen in a different way but more importantly, in fidelity to the original purpose of ancient Greek theatre, it was a place for catharsis, a place for us all to grieve together. We in the audience were weeping as the women, who appeared like titans at this point standing strong with sand falling from their hands, still carrying the earth with them, still carrying Syria, and still carrying the hope that their homeland, like them, will survive. – Tanushka Marah is a British-born Palestinian/Jordanian theatre director, actor and teacher. She was a winner of the Young Vic director awards in 2002. With her own theatre company she toured her production of Medea in the UK and Europe. She has toured extensively in the Middle East.